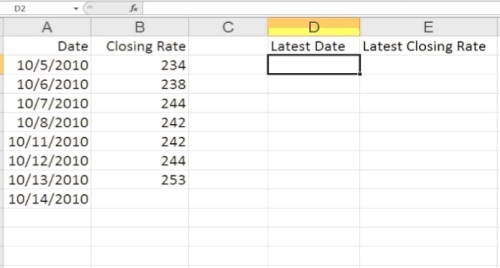 In this tutorial, you will learn how to use the OFFSET function in Excel. 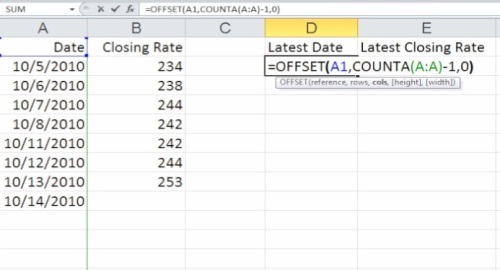 The offset function returns a reference to a range that is a given number of arrows and columns away from a given reference. In our example, we will want to check the last entries of column A and column B, the Date and the Closing Rate respectively. Step 1. Position the cursor where you want the result to appear. And hit Enter. The result is brought automatically. Step 3. We will do the same with the next field, Closing Rate. The result will return the last field of the column B. Step 4. Experiment with adding more: your calculations will update. Result: Congratulations, you have learned how to use the OFFSET function in Excel.